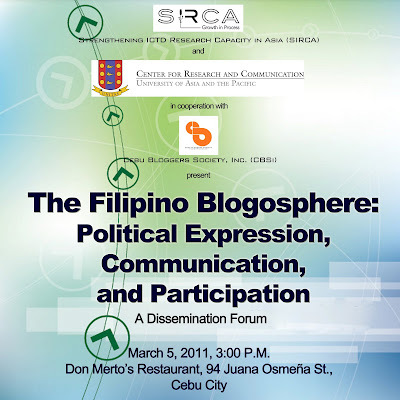 I had FUN Moderating, Speaking, Sharing, and Listening on my thoughts, other speakers' thoughts on Political Blogging and its impact during the 2010 elections during a Filipino Blogosphere: Political Expression, Communication~ dissemination forum organized by Strengthening ICTD Research Capacity in Asia (SIRCA) and Center for Research and Communication of the University of Asia and the Pacific. There aren't that many Political Bloggers in Cebu, (I only know Kevin Ray Chua and Jerry Gervacio)I am not so sure about the rest of the Visayas though but in mainstream media there are a lot of commentaries from established Journalists but is not shared online (As far as I know). The local blogging organization CBSi is politically neutral, and that there actions, or whoever they support during the historic May 2010 elections was by all means are theirs and theirs alone. Though we did do iVote, iBlog Election Coverage to have a varied view on the different experiences of bloggers in their respective areas. In Reference to #3, I found something interesting among Netizens[students] (Not necessarily bloggers, though). 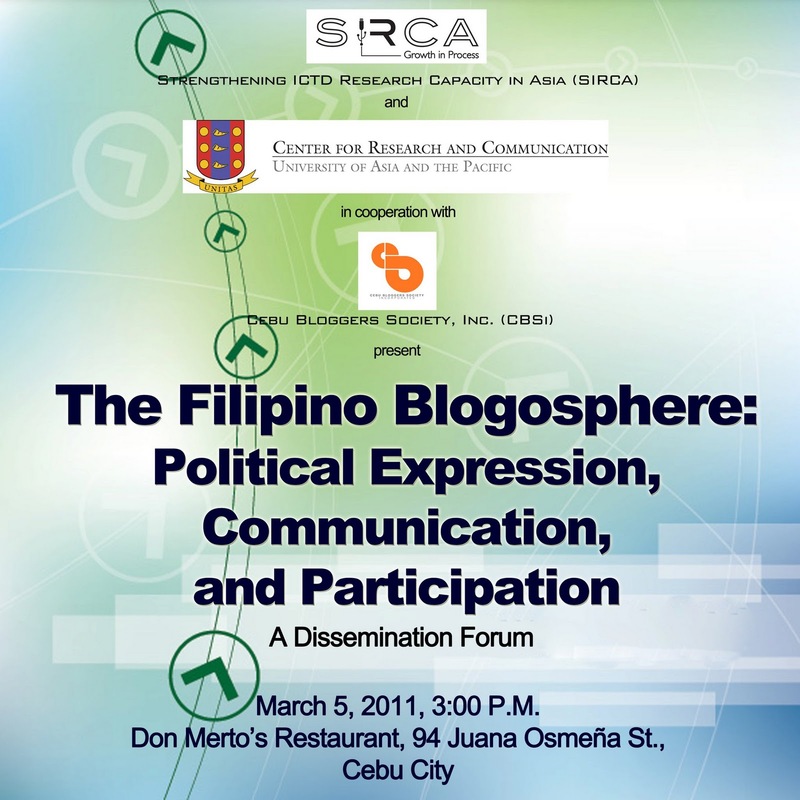 The forum entitled "The Filipino Blogosphere: Political Expression, Communication and Dissemination Forum" was held at Don Merto's Restaurant, 94 Juana Osmeña Street, Cebu City, it was attended by local bloggers, members of the mainstream media, some students, and interested individuals. Though not all were satisfied by my presentation after the event, it is still fun and a learning experience. View more presentations from Vernon Joseph Go. I am not affiliated with STAND, Tingog or the like cited student organizations/party and am not promoting them. Special Thanks to my fellow speakers, organizers (CBSi), SIRCA, Ms. Mary Grace P. Mirandilla-Santos and participants for joining the event! Helo! I am Jimdel I found new chat live software called http://chat.ph is now available if you find friends www.chat.ph can give you. This is for good communication and for good organization, friendship, family, co-worker and relatives etc.